AJ Styles Vs Chris Jericho II On SmackDown! AJ Styles was a phenomenal signing for WWE. He was so phenomenal that WWE decided to put AJ on the main roster as soon as he arrived. Think of all the stars that have wrestled on NXT before appearing on the main roster. Kevin Owens, Hideo Itami, Sami Zayn, Samoa Joe and even Jushin Thunder Liger have all appeared on NXT instead of first debuting on the main roster. Imagine that you’ve got a star like AJ in your ranks. You’ve got a man that was a major part of the development of TNA, which had been the second top wrestling promotion in the world for years. You’ve got a man that was the IWGP Champion just before he left. It’s the same title held by the likes of Brock Lesnar, who is considered a very special attraction for WWE. You’ve got a man with phenomenal skills in the ring and could give you a new legitimate star in your ranks. Less than a month into his career, AJ’s promising career in WWE has already been ruined in the exact same way that so many new stars could have been created. 50/50 booking. In case you missed SmackDown!, AJ Styles lost his first WWE match and he did it clean. He lost his big rematch against Chris Jericho to a simple codebreaker. How does this do either man ANY favours? How does it do Chris Jericho any favours? He’s not exactly going to have a big part in the future of WWE. He’s coming towards the end of his career. He should not be beating guys like AJ Styles so cleanly. Wouldn’t it make more sense for Jericho to lose to AJ again and have him keep losing until the end of the feud? Each time Jericho loses, he gets more and more annoyed with himself. It’s a simple feud which will elevate AJ whether he loses the final match or not. It doesn’t do too much damage to Jericho as he still would likely win the final match. I really don’t understand the logic of having Jericho suddenly being booked as one of the best wrestlers in the company again. Jericho is 45 years old and has not won a championship since 2010. The idea that he is on par with the top stars in the company in 2016 is just absurd. He even lasted 50 minutes in the Royal Rumble match. How bad does that make the rest of the wrestlers look when Jericho is leaving them in the dust? I get that Chris Jericho has historically been a top star in WWE but you can’t be booking him so great right now. My idea earlier about having Jericho getting more and more angry at himself for not being able to put AJ away would actually be a great bit of character development for Jericho, as it would be Jericho questioning whether he could still hang with the best any more. You can’t go from having Jericho putting over guys like Fandango to beating AJ Styles in an instant as it just seems unbelievable. You’ve had Jericho putting over younger stars for years, so it’s going to be hard to convince the casual viewer that Jericho is as good as everyone else after not accomplishing a great deal in the last five years. WWE’s sudden insistence on putting Jericho over as a top star in 2016 is just infuriating to me. It was like the Highlight Reel segment a month ago, when Jericho said that he, Roman Reigns and Brock Lesnar were the three favourites to win the Royal Rumble. Again, it makes everyone else look bad. I’ve been talking about Jericho for a while but the one that will likely ne most effected by this match is AJ. Now AJ Styles is in the same position as everyone else on the roster. He is beatable after just a few weeks. I’ve seen everyone get beaten eventually. There’s never been a professional wrestler that has never lost a match. That’s just how wrestling works. They beat Goldberg. They beat Brock Lesnar. They even beat the Undertaker at Wrestlemania. However, a new star should always be protected when he/she enters your company. AJ Styles, in particular, should be promoted as one of the best you have to offer. He should be one of the wrestlers that you should be protecting as he’s just arrived in an emphatic way. Now though, he’s been subjected to the same detrimental booking as everyone else on the roster. WWE’s idea of “50/50 booking”, to make sure that they don’t upset any particular fan bases, is just going to kill any attempts at creating new stars. That will result in the fans only showing a great deal of interest in the likes of Brock Lesnar, Roman Reigns and John Cena. Therefore, the fans will only be invested in those characters. In a time where stars need to be made, there has to be a lot more wrestlers exempt from this booking and AJ Styles is someone that should have been spared this. This was a poor decision by WWE to have him lose to Jericho and to have him lose this early into his WWE career. Brooklyn was packed for the second biggest PPV of the year. 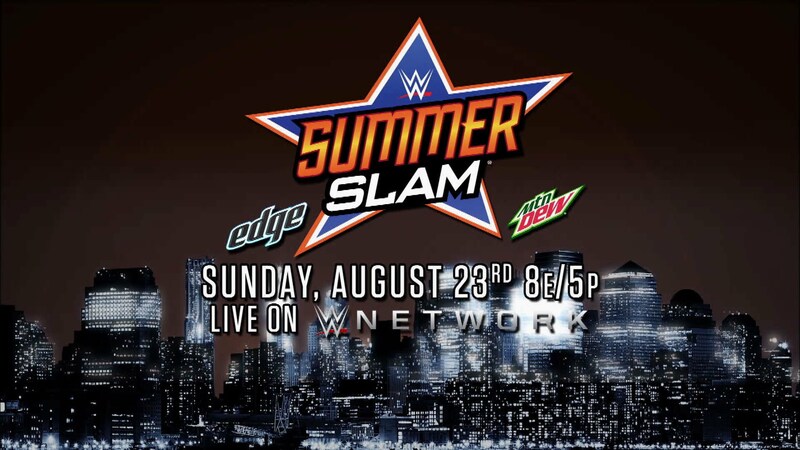 We had scores to settle, title for title matches to take place and quite the card for Summerslam. Let’s get into it. Orton almost scored an RKO right away but Sheamus moved out of the way. We got “You Look Stupid” chants to which Sheamus got on the mic, replying with “I don’t look stupid”. Sheamus saying stuff like this on the mic takes away the seriousness of this lad. And that’s not good, considering that Sheamus has the Money In The Bank briefcase. Considering he’s probably going to be our next WWE World Heavyweight Champion, Sheamus looked a bit of a joke. However, it could have been a lot worse. To be honest, after he said it, I thought as soon as he returned to the ring, Randy was gonna drop Sheamus with a successful RKO to win the match. That didn’t happen and the match went on. However, the fans interest in this match began to disappear at the start. Among the chants we got was a very loud “Ole” chant! However, the match did pick up shortly afterward, which got the fans into it again. Randy delivered a T-Bone Suplex to Sheamus over the top rope which I thought looked pretty cool. Sheamus put on a modified Clover Leaf and kept saying “ASK HIM!” as heels normally do when they’ve got a submission locked on. Chris Jericho use to do it quite a bit. What I realized though, when Sheamus had it on, was that the referee’s rarely ever actually go on ask the wrestlers if they quick! They usually just stand over them! There was a great little spot where Sheamus lifted himself up up onto the top turnbuckle but Randy countered it into a DDT. Randy hit Sheamus with a RKO when Sheamus catapulted in him which looked awesome. Sheamus beat Orton CLEAN with two Brogue Kicks in a row. This is exactly the type of win that Sheamus needed after losing to Orton clean at Battleground. I thought this match was really good. At the start it looked a bit slow-paced but then it picked up in a big way.It was a great opener. I think this would have been better than their Battleground, had it been given a bit more time. However, considering the card, you could see why the time of this match was cut down a little. This match seemed to go to the finishing spots rather quickly. It’s almost as if they cut a huge section of the match and then just went to the closing moments. However, despite that, it was still a good match and a great way to open the show. If there’s a rubber match at Night of Champions, Sheamus has to go over I think. However, if this is the end of the feud, at least Sheamus goes out with a win. This match was a very fast-paced tag team match. There was one spot at the start of the match which I thought was pretty clever. Big E and Titus O’Neil were the legal men in the ring. However, Kofi tagged himself in… by tagging Titus. So as he tagged himself in, Big E went for the cover on Kofi in an attempt to steal the tag titles! I’m not entirely certain if that works! I thought it was clever but… not quite sure it was allowed! I mean you didn’t have to pin the champions in order to win the title. Since you can tag anyone else in order to get into the match, I guess Kofi could have tagged Titus… giving us TWO LEGAL MEN! I guess the New Day just created a new precedent in WWE! Big E was during this match. He did a splash onto Darren Young on the ring apron which I thought looked good and then Big E began slapping Darren to the New Day clap rhythm as he had the abdominal stretch locked on! To be honest, there were a lot of good spots by everyone during this. Darren Young and Kalisto had a sequence at the start which looked incredible. People on Twitter were comparing them moves to Tekken and Mortal Kombat, which I thought was hilarious! Titus O’Neil came in off the hot tag and was awesome during it, taking out everyone. He was incredibly over with the crowd as they rallied him on. Xaiver Woods taking out El Torito was a highlight! There were two little botches that should really be mentioned. Sin Cara botched a hurracanrana. One of the Los Matadores members was supposed to take the Tower of Doom spot near the end of the match, but he fell off the top rope. However, they were able to recover well as the other member of Los Matadores simply took the spot also involving Titus. But other than those small minor botches, this was a sound tag team match. The New Day’s celebrations were amazing. Totally the right call by having the New Day go over. They were so over tonight and are the most over stable in the company. WWE teased the New Day defending the tag titles against Roman Reigns and Dean Ambrose next. I really hope that happens! It’d be a great way to get the group into the main event picture! I hated the commentary for this match. It was basically JBL, Jerry Lawler and Michael Cole arguing about Lana’s role in Rusev’s success so far. It was one of the times where the commentators never pay attention, that winds me right up. Firstly, because I don’t like this storyline. I don’t like the storytelling aspects of the match, and I’m really watching this because I want to see a good match between Rusev and Ziggler. The announcers weren’t paying attention to this match as they were too busy talking about Lana, not even given Rusev and Ziggler enough respect to talk about them. I can’t speak for everyone watching this but I don’t care about the storyline aspect of it because this is a bad storyline. Anyway, to the match itself. The match wasn’t really that exciting. Ziggler’s facebuster to Rusev. off the top looked sloppy. I thought Rusev got in a few good spots, such as the flip senton onto Ziggler which looked awesome when it connected. A good ending might have improved this match slightly, but the finish here had a negative impact. It was a double count out finish meaning that this match was basically just a waste of time. They had the brawl at the end with Lana and Summer Rae also involved but it didn’t solve anything. No new developments happened during this match that changed the fans outlook into this storyline. This ending was shameful for a PPV like Summerslam. JBL actually pointed out “Nothing was solved.” JBL basically confirmed that this match was pointless and we just wasted your time. The thing is, this storyline is now going to keep GOING. It’s not doing anything for Dolph Ziggler and Rusev. Why is WWE keeping this going? After this match, why would people possibly care about a rematch at Night of Champions? I want to point before we get into the match that the WWE production crew missed quite a lot of important stuff during this match! They missed Stephen Amell tagging himself in for the first time, which is kind of important considering he’s the celebrity in this match! They missed Stephen’s kip up, which is supposed to make Stephen look good! I was just shocked by how much they missed during this show! To be honest, when this match was first announced, I thought they had brought in Neville to do the “heavy lifting” for the team since he was the actual wrestler of team. However, Amell was tagged in the majority of the time. He took a lot of the bumps. He didn’t deliver a great deal of offense but you wouldn’t really expect him to. I loved during the match, when King Barrett kicked Amell in the stomach. His sell to that kick was just hilarious. Neville actually got the hot tag for his team and scored the pin. For what it was, Amell didn’t really mess anything up. I wish that Neville had a lot more time in the ring as it meant that there was a lot of pressure on Amell to take the spots in the ring. Granted, he was able to take them well. But I think with these matches were celebrities get involved, they really should be in the ring as little as possible. This was a very short triple threat match, which I think was a good thing. I think it needed to be a short and sweet triple threat and this match wasn’t actually that bad. However, there’s a few things I need to point out. Now if you’re a 7 foot, 450lb giant, why on earth would you need to jump off the top rope? Big Show started to do diving elbow drops off the top in a number of matches. In this match, Big Show did a rolling senton off the top! This senton completely missed Ryback! I admire the effort but since when does Big Show need to do a rolling senton off the top rope? Michael Cole mentioned that last time the Intercontinental Championship changed hands in New York City was when Albert won the title. JBL’s response was… “Albert won a title?” I love how JBL completely buried Albert’s title reign when years ago, he was praising “Tensai” like he was a Japanese wrestling legend! Great job JBL! I almost thought Miz was going to win when he hit the Skull Crushing Finale on Ryback but Ryback kicked out at the last minute. Miz then made like six covers on both Ryback and Big Show which was pretty funny. That was actually a pretty fun spot. I didn’t like the ending. 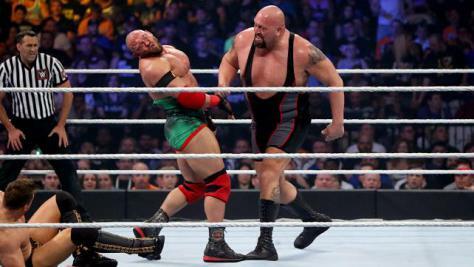 Ryback stole the victory after Big Show had knocked out The Miz, which is what heels do. A big, tough face shouldn’t need to be sneaky in this type of match. With that in mind tough, this match was much better than I thought it was going to be. Thankfully, it didn’t go on for too long. It was short and simple and it told the storyline well. The ending kind of ruined it for me but I’m glad Ryback got the win. Roman Reigns got heavily booed during this match. This was a pretty fun tag team match with a lot of cool spots for everybody to get involved in. Roman Reigns got took out early on in the match, leaving Dean Ambrose on his own in the ring. Roman Reigns was out of action for so long that the fans started chanting “Roman’s Sleeping!” But as soon as he got tagged into the match, the fans started booing him! Roman just can’t get a break, can he? I thought that the end of the match was pretty lame. All it mostly consisted of was Reigns and Ambrose dominating. There was nothing about that match that made Bray Wyatt and Luke Harper look strong at all. There was no moment where I was convinced that Bray and Luke were going to win. This match made them look really bad. However, this tag team match was still OK though. Nothing really special about it but it was a pretty fun one. John Cena was overwhelming booed. Seth Rollins got a massive pop when he came out. Early on in the match, Seth Rollins did a spot where he did three dives to the outside. However, it looked like Cena was supposed to catch him for a spot the first time he did it. Were they planning another spot? It kind of looked like it to me. Despite this, Rollins looked awesome anyway and the crowds loved it. This was a pretty great match but the fans were chanting “You can’t Wrestle” at Cena. It’s one thing if you don’t like somebody. It’s another thing to watch a wrestler when he’s having a blinder of a match and still chant, “You can’t wrestle”. Cena wasn’t having the greatest match of his life, but he was doing fine. Also, when you’re in the ring with somebody as talented as Seth Rollins that can help you along, there’s little that can go wrong. The only thing I remember Cena botching was his top rope leg drop, which didn’t really connect. There’s one issue I have about this match. It was a great match but I had an issue with Cena and Rollins using the finishing moves of so many different wrestlers. John Cena did Ric Flair’s figure four leg lock and he did the Springboard Stunner again (paying home to Stone Cold). Seth Rollins did Triple H’s Pedigree, Eddie Guerrero’s Frog Splash and Cena’s own Attitude Adjustment. When people steal other wrestler’s moves, usually it’s cool. However, Rollins and Cena were losing their own sense of identity by obviously paying homage to other wrestlers. Now Seth Rollins’ Frog Splash has probably been one of Rollins’ signature moves for years and Cena’s Springboard Stunner is now one of Cena’s signature moves. But it’s taking away from the uniqueness of Cena and Rollins if they have to use other people’s moves so blatantly to get over. With that being said though, Seth Rollins rolling Attitude Adjustment onto Cena was just incredible. He pulled it off really well and I kind of wish that was the finish of the match. It would have been a lot better than the actual finish of the match..
Summerslam guest host Jon Stewart ran down into the ring with a steel chair. After teasing a chair shot onto Rollins, he hit Cena in the gut with the chair, allowing Seth Rollins the opportunity to pin Cena with a Pedigree onto the steel chair. I HATED this ending. I mean, if this was an ending to a title match on RAW or something, maybe it’d be OK. But Jon Stewart’s interference played into the CO-MAIN EVENT of the SECOND BIGGEST PPV OF THE YEAR! That’s why this infuriates me. It was not like Jon Stewart was going to play into future WWE programming. And on RAW, WWE basically confirmed this with Cena giving an AA to Stewart. It was atrocious. It ruined such a great match between Cena and Rollins. After all the build, it ended like that. Team Bella vs PCB vs Team B.A.D. The fans weren’t really into this three team elimination match. I think after Team B.A.D. were eliminated, the fans’ interest just dropped. Sasha Banks was really over at Summerslam and the next night on RAW. There were “We Want Sasha” chants on RAW and I don’t think WWE really see any potential in Sasha. Considering what happened the next night on RAW with Sasha Banks nowhere to be seen, I think the attention is now focused on the Bellas and PCB. After all, Team B.A.D. were eliminated first in this match! Brie Bella’s facebuster off the top on Tamina to eliminate her was better than Ziggler’s in his match with Rusev. The match itself was an OK divas match. Credit to Kevin Owens this weekend. He wrestled the ladder match with Finn Balor on the night before at NXT TakeOver and followed it up with this 15 minute match with Cesaro on Summerslam. He’s had to put in a lot of work over the weekend and he put in the work in this match. It was a good match between these two. I’m not sure about killing Cesaro’s momentum by having Kevin beat him clean but I guess they had to preserve Kevin. This match was special. It was an incredible match to watch with some great story-telling on display. Undertaker and Lesnar seemed to be taking this match slow and steady which was the right call I think for this match. The fans were into it from bell to bell. There were a lot of amazing spots to take in and it was definitely better than their last match. However, the finish is what got the fans talking. Brock Lesnar had Undertaker locked in the Kimura Lock but Undertaker was able to force Lesnar’s shoulders on the mat, causing referee Charles Robinson to come over and make the count. But as he was watching Lesnar’s shoulders, Undertaker tapped out. Charles didn’t see the tap out but the time keeper rang the bell anywhere. Charles was arguing with the time keeper and everybody was distracted when Undertaker low blowed Lesnar. Undertaker then locked in the Hell’s Gate and he made Lesnar pass out for the “official” victory. I guess like the Cena/Rollins ending, it’s a give or take ending. I HATED the Cena/Rollins ending. The ending for Lesnar/Taker was not really what I had hoped. 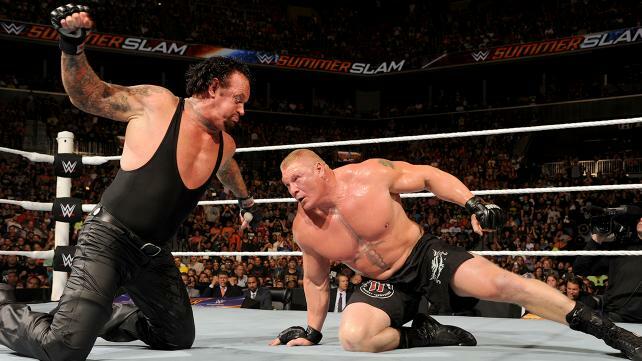 However, it did preserve both Undertaker and Brock Lesnar as they both won the match in their own right. Following a number of intern general managers in charge of the show, things got changed up a notch with the annual Slammy Awards to reward the very best WWE had to offer this year. And it kicked off with Slammy host Seth Green being introduced by Jerry Lawler. Seth was cut off by The Miz and Damien Mizdow acting all Hollywood buddies with Green. Green responded by putting Mizdow over, referring to him as an A-Lister rather than Miz. Of course, the crowd popped. And of course, Miz got upset. While Mizdow stuck the role, he couldn’t help but signal Seth to “call him” before he departed off the set and again on Twitter later on! Green stuck around to announce the nominees for the “This Is Awesome” moment of the year, including Daniel Bryan occupying RAW and Stephanie McMahon getting arrested. But before the winner was announced, Dolph Ziggler took on Mr Money In The Bank Seth Rollins. This was a very short match but these two do have good chemistry. However, I have to say the ending seemed to make Ziggler seem weak as the stooges got involved, causing Seth Rollins to hit a simple curb stomp for the victory. Not to down-grade the Curb Stomp but considering how much Ziggler went through at Survivor Series, this loss did Ziggler few favours leading into his ladder match with Luke Harper at TLC. Getting back to the award, it was Sting’s debut at Survivor Series that got the “This Is Awesome” slammy, which prompted Seth to do his best “angry-heel” impression by calling out Sting for getting rid of the Authority. He accepted the award of Stinger’s behalf. Kofi Kingston represented the “New Day” as he took on Stardust, following the promo cut on the New Day by Gold and Stardust on SmackDown! On paper, this is a very appealing match. But with limited time on television to perform, there was little either man could do to really deliver. The match had a real bland ending to it as well as Kofi got the pin off a crossbody,, giving the New Day to win. Two members of the New Day will fight the Golden duo on the TLC pre-show and I do hope that whoever’s in the match for the New Day, along with Gold and Stardust, get a chance to do a lot more to really put on a show. It’s also a chance for WWE to sell the New Day gimmick, as it seemed not a lot of people were really interested in it tonight. Few people got in with the “New Day” chants and it’ll be a hard deal for WWE to sell. Let’s see if they can do something to spice things up. One of my personal favourite general managers of all time, “Big Johnny” John Laurinaitis returned to WWE to present the Surprise Return of the Year slammy. I already have a problem with the naming of the award. It just bothered me that they called it the “Surprise” return of the year as all the nominations, except The Rock, had their returns announced beforehand! But anyway, the Ultimate Warrior fittingly won the award. We had a good little backstage back-and-forth from Paul Heyman and Seth Rollins. Seth threatened to cash in Money In The Bank on Heyman’s client WWE World Heavyweight Champion Brock Lesnar, while Heyman suggested that Rollins focus on making sure John Cena is put in the past before he can become the future of WWE. The segment pretty much set in motion a Slammy win for Lesnar later on. Santino presented the award for the “OMG Shocking Moment of the Year”. Despite the likes of Seth Rollins selling out the Authority being on the list, nothing could top Brock Lesnar conquering Undertaker’s undefeated Streak at Wrestlemania. But before Paul could cut a promo, Bray Wyatt made his way down to the ting. You know if you’re cutting a Paul Heyman promo that something good should happen. A solid promo as usual by Bray Wyatt hyping up his TLC match with Dean Ambrose leads to Dean making his way into the arena in an ambulance. He attacks Wyatt, declaring that he would become the monster and would eat Bray alive. Not much said by Dean but not a lot needed to be said – war is coming this Sunday at TLC. Jerry Lawler returned to the stage to present the Diva of the Year. AJ Lee ended up winning, which I’m not so sure was the right choice. But regardless, AJ did a tremendous job in putting over losing nominee Paige her acceptance speech as well as the likes of Emma and a number of NXT divas. AJ’s looking to the future but stated her desire to become to rule as the queen of the division. Nice little promo from Lee. In spite of all the CM Punk chants which tried to ruin this moment, AJ cut a good promo and did an awesome job putting over a lot of the divas. Speaking of cutting good promos, John Cena actually did a good job hyping up his match with Big Show. He mentions Vince McMahon saying on Steve Austin’s podcast that all the stars needed to step up and John said he would step up to take care of the “traitor” Big Show. Now we move on to Erick Rowan vs Luke Harper. First of all, where was the hype video for this match? A match as highly-anticipated as this was, should have had like a mention from commentary a lot sooner. Not that the match was designed to be a big deal – Luke Harper got disqualified early on from hitting Erick Rowan with a ladder. The brawl that ensued was nice to see to make up for the extremely short match. I would love it if this two started a huge program soon. This has potential. The same old Rusev and Lana routine was replayed as Swagger looked to avenge Zeb Colter after Rusev “broke his leg”. This segment actually made Swagger look real stronger against Rusev. But I just hope he looks strong in their match at TLC. Ryback teamed with the Usos to take on Kane, The Miz and Damien Mizdow. Even though this was Damien’s third time on the show, the fans still wanted Mizdow! And Mizdow was a delight to watch! The highlight was Damien flipping over to imitate a suplex onto the Miz! Mizdow also threw himself out when Miz was thrown out which was funny. This six-man tag team match was actual a decent match, despite being a bit short. However, having said that, It was a lot a longer than most of matches on this show! So I give these guys credit. Ricky Steamboat awarded Match of the Year, which was given to the Team Authority vs Team Cena Survivor Series match. Like most of Twitter at the time, I believe that The Shield’s match with the Wyatts at Elimination Chamber should have been a nomination and it should have won. But regardless, Ziggler was able to accept it and cut a nice promo about his performance at the PPV. AJ Lee v Summer Rae was a decent but short match, which has been the story for a lot of these matches tonight. It’s a shame, because a lot of these matches had the potential to be a lot better if given the appropriate TV time. Rob Van Dam, looking mighty dapper in his suit, presented the Extreme Moment of the Year which went to Chris Jericho jumping off the cage onto Bray Wyatt. Interesting to note, Jericho was announced as next week’s guest host. I dig that. Jericho’s back on television and he would be part of a highly-energetic RAW just after TLC. Booker T awarded the final award of the night. He awarded the “Superstar Of The Year” award. I’m surprised Randy Orton was not a nomination for this award when the likes of Daniel Bryan, who had wrestled for about five months before being injured, were. It’s a shame that Orton didn’t get a mention, but maybe it was WWE trying not to draw attention to Orton while he’s away. Shockingly to me, Roman Reigns won the award. He’s had a great year though, and he put everybody on notice that he would be back soon. The main event featured John Cena taking on the man that knocked him out at Survivor Series, The Big Show. I realized this just before the match. This was the exact same main event as the RAW before TLC from two years ago, when Show took on Cena and the Shield broke it up. The match itself was not a show stealer to say this least, with the match being really slow paced. A few big feats of strength from Cena got the fans popping including backdrops and Attitude Adjustments. Seth Rollins broke up the pin causing a disqualification. Eventually a huge brawl broke out. 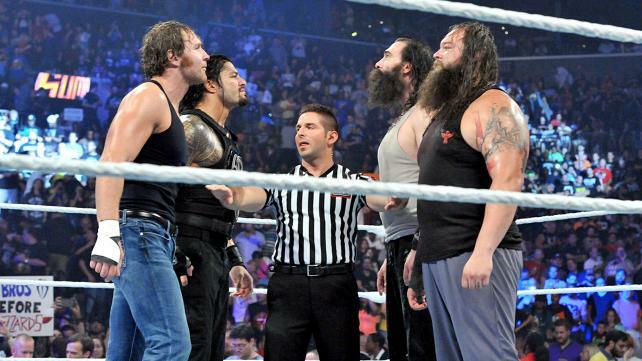 The likes of Ziggler, Rowan and Harper came out with remnants of the Authority and Team Cena brawling. There were a lot of good spots in this brawl actually, with Big Show chokeslamming Erick Rowan on the steel steps and Ziggler pushing Rollins off a ladder. In the end, Seth Rollins stood tall after delivering a Shield-like powerbomb to Cena with help from Jamie Noble and Joey Mercury. A good way to end RAW. I think if you were tuning into RAW this week wanting more of the in-ring action, I think you were let down this week. A lot of the matches were very quick and not given nearly enough time to make an ever-lasting impression. However, I do think this Raw did a good job with hyping up TLC this Sunday which was one of its main objectives. The big brawl at the end especially gave this RAW some redemption as Tables, Ladders and Chairs arrives this Sunday!